Stephen W. Terrell's (MUSIC) Web Log: WACKY WEDNESDAY: Equal Time for Goblins! While recently putting together my Big Enchilada 2016 Spooktacular, I had no problem finding songs about witches, ghosts, devils, vampires and werewolves. But one group of demonic supernatural beings that are severely under-estimated in the Spookbox Jukebox is the humble goblin. There just aren't that many songs about them. But fear not -- or since it's almost Halloween maybe I should just say "Fear!" -- I found a few for you. We'll start with this obscurity from Rosemary Clooney, who revealed in 1950 that goblins ride flying brooms. Thirty years later Frank Zappa was still playing with Clooney's goblin/wobblin' rhyme. This is another song called "Goblin Girl" by a late '90s garage/punk band from Chicago called The Goblins. 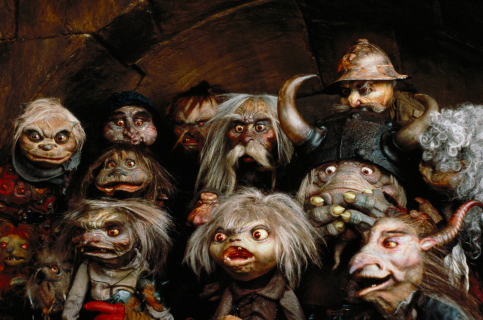 It's rumored that The Fall's Mark E. Smith has a little Goblin in his ancestry. Mystery Science Theater 3000 had their own Hobgoblin song, in honor of the 1988 movie Hobgoblins.